Click on the cover above to access the online version of the fanzine we produced for the Rockers’ game against Bristol Roller Derby this weekend. There are a few spare physical copies, which are available on the flyer shelves in the Evening Star pub by Brighton station from early evening today (Sunday 21st). You can also find an A4 version of the dress up referee doll to print out here. Huge thanks as ever to all the lovely interviewees, photographers and advertisers. Cheerses. As featured in Issue 8 of our fanzine Turn Left, here’s a full A4 size version of a cut out and dress up referee doll. Click on the image below, or right click ‘Save As’ to download it to your computer. We recommend printing onto A4 inkjet card if your printer can handle it. Be careful when using scissors (get an adult to help, or a child if you are an adult) as some bits are a little fiddly to cut around. Cheerses. 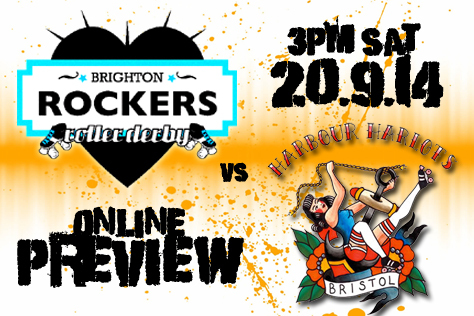 The mighty Brighton Rockers are back in action at the Dolphin in Haywards Heath this Saturday (20th Sept) and their opponents could arguably be described as their ‘nemesis’. Brighton and Bristol went into what was both sides’ first ever tournament back in May 2013. Taking place in the heady surrounds of London’s Alexandra Palace, it was the inaugural (and to date, only) UKRDA Southern tournament. Brighton had initially entered the tournament as second seeds, but a late switch (Central City replacing Big Bucks) saw them ranked third of five. They were certainly expected to beat Bristol, however, which made their 175-251 defeat to the Harlots something of a shock. Indeed, this was the first – and so far, the only – time that a lower ranked side has beaten the Rockers. The game starts at 3pm with doors at 2.30. Tickets are £8 adults (free under-12s) with group and student discounts if you buy online in advance. The venue (which has ample parking) is roughly six minutes walk from Haywards Heath train station – turn left when you leave the station and follow the signs/crowd. There’s a big Sainsbury’s en route, and the pub opposite the station is sporty but palatable, with a big garden to the rear. The leisure centre recently changed hands and offers a fairly cheap (if fairly warm) bottle and can bar within the sports hall itself. There’s also a foyer cafe bar and vending machines. Be sure to pick up a free copy of our redesigned Turn Left fanzine (from which the quotes below come) at the game – this one’s a fashion special. The after party is back in central Brighton at the friendly and alcovey, if slightly spendy, Victory Inn. A is for Alcohol. Call us rambunctious old soaks, but one of our big concerns going into this game is ‘how will things change under the new regime?’ Not the Rockers’ regime – although the league has undergone a major directorial switcheroo – but the venue’s. Freedom Leisure have lost control of the Dolphin to DC Leisure, whose yucksome ‘Places for People’ brand name has us a little fearful. Will the ‘secret’ gym bar no longer be usable by derby fans? Indeed so. Good news though: There’s a bar inside the hall itself for the first time. Bad news though: It’s a trestle table with a shoebox fridge that seems to make things warmer rather than colder, and a selection of drinks that can best be described as eclectic. It looks like they gave the bloke working the bar thirty quid and told him to get what he could from Sainsbury’s. Shades of student house party kitchen detritus. The two bottles of lukewarm Bacardi Breezer sat in the defridgerator will be amongst the leftovers, and we’d like to think the Dolphin staff will tip all of the unsold cans and bottles into one big bowl, call it ‘punch’ and hammer through it at the end of their shift. B is for Brighton’s squad. A number of factors, such as impending wedness, wanderings and workloads, have shorn the Rockers of a chunk of their squad recently. Some of the missing players are in the room, but in trackside roles such as line-up manager (Racey) or merch-peddler (Ultrafoxx). There are two ‘new’ additions to the Rockers fourteen, however, in the form of a recent transferee and an injury returnee. More on those individuals later – we have another 24 letters to fill. C is for Croydon’s ambitions. Great they are. Indeed so. As Yoda might say if he followed English roller derby and was slightly less fictional. The South Londoners have stopped fare dodging on trams, burning down their own town and [insert your own lazy Croydon stereotype here] for long enough to build one of the country’s fastest rising derby leagues. A couple of years ago the Rockers would have wiped the floor with CRD, but now (as a couple of battling closed door games demonstrated) the gap between the two sides has shrunk greatly. Given the sparsity of leagues south of the Thames, the two sides are effectively neighbours. The close derby friendship between Croydon and Brighton – very different to their relationship in most other sports – merely adds to what’s at stake/skate here. Oh yes, we’re in for a humdinger! D is for Derby McGee. There’s a temptation as a semi-savvy spectator to sometimes think of Brighton’s packs as ‘The Mighty Mighty Bash and three others’, even though the iconic Rockers taliswoman will likely feature in less than half a game’s defensive line-ups (and more like 25% if she’s being called upon to jam regularly). Largely that’s down to how much harder the role of a blocker is to understand than that of a jammer. “The blockers are the sods who slow down the game and stop people scoring, yeah,” as a friend watching their first match remarked to us, “before being sent off for some seemingly arbitrary reason.” It’s hard to argue with that analysis, which is why we recommend audience members spend one or two jams a half not following the lead (or Rockers) jammer, but following a Brighton blocker. One who isn’t Bash, as you’ll likely see even more nuances of her play (it’s not all just knocking people over!) from the way she interacts with the person you’re following. We’d suggest someone like Hairy Fairy, Dr Whooligan… or Derby McGee. E is for Estimated result. Croydon aren’t members of national governing body UKRDA, so we had to turn to the European rankings to see how this one was predicted to play out. 82% chance of a home win, they said. 195-130 or thereabouts to Brighton, they said. They were off by quite a margin. F is for First whistle. Blowing the first whistle is the roller derby equivalent of bowling the ceremonial first pitch at a baseball game. US Presidents, celebrities and others have done the latter, and we’ve seen plenty of confused provincial Mayors attempt the former. Today’s game sees the de facto ‘guest of honour’ going one step further and jamming the first jam. As pleasing as it would be to see the Mayor of Haywards Heath on skates and up against the Croydon pack – and to be fair to Mrs Ellis, we reckon she’d give it a go – today’s (sort of) ‘guest of honour’ is actually Mistress, one of Brighton’s top jammers, here playing in her final A-team game. 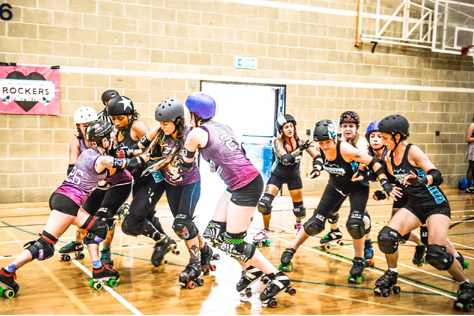 It’s perhaps testament to how close Brighton think this one might go that it’s the first rather than last jam of the game she’s taking the star of honour in – the Rockers want to keep their options open for the endgame. We’ll gloss over the jam itself (penalty call, power jam, 13-0 to Croydon) out of politeness. G is for Gin Atomic. One of a handful of CRD players who actually live and work in Brighton, which is another reason why such a lot rests on the result of this game. There’s been plenty of good-natured banter, on Facebook and in the flesh – in bars and on beaches, across skate parks and supermarkets – in the run-up to today. There will also, of course, be bragging rights aplenty available to the victors. “Bring it!” as they say. H is for Haywards Heath station. The trains are monumentally spangled today. Up to an hour’s delay on the 15-minute journey from Brighton. A lot of people being told to change at Hove. Trains from East Croydon gubbered as well. That’s not the reason for the delayed start to today’s proceedings, although this is helpful for those struggling to get here. The track laying equipment arrived late. This always seems to happen, at every roller derby event ever held, anywhere in the world at any time in history. Meanwhile, train troubles (and geography) might be one reason that most of the Croydon posse will hold their own after party in the pub opposite HH station, rather than join the official one back in Brighton. Also: giant Jenga. I is for Into the action. 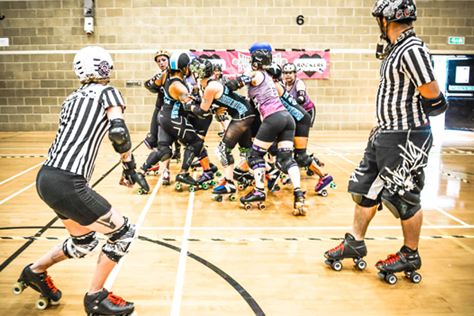 Brighton have chalked back a few points, with Rose Bleed, Bash and Whooligan taking the star in quick succession, but the CRD Riot Squad are staying a fair way ahead. A lot of that’s down to Vikispeedia, a regular in the Croydon star, who might sometimes take a while to get past the Rockers pack, but once through she turns on the pace that her name suggests and forces a quick call. Do Or Dyduch takes advantage of a power jam (Bash sin binned) to edge it up to 24-9. Bash back on next jam, up against Gin, and Rockers pivot Shambolic is having an on-off relationship with the floor, as tough blockers like Inara Terror and Mosquito set to work. Sham gets some measure of revenge in the next jam, starring up and taking the inside line to pull it back to a six point game. Another jammer penalty against Bash and a PJ start for Viki sees CRD double the gap, before a single pass for Whooligan pulls a little back. Team timeout Brighton. J is for Jam 12. More aggressive here from the Rockers as the game resumes. Rose v Gin, the former taking lead, the latter being recycled well and inadvertently pegged back by her own pack. Brighton could close things here, but there’s a penalty called on the Sussex starhead, and it goes the full two minutes with CRD extending their lead. Rockers take LJ again in the next jam, with Bash sending Nikki Blocker Glory flying as Sham swoops through, before picking up the almost inevitable track cut. Full two-minute jams in this heat must be quite the marathon out there, and we’re getting plenty of them. Whilst the jammers are picking up a fair few penalties, the sin bin’s blocker seats seem to be even more in demand. This is a tough, physical game – you feel that whichever side can keep a better lid on their blocking offences will probably take the win. Polly Filla held back well as Brighton claw back to near parity, but a fantastic apex jump (and accompanying punch of the air) from Dyduch in Jam 17 sees Riot Squad edging away once more. She, Gin, Polly and Viki keep banking points as the first half comes to a close. Croydon sit on the smiley side of a 66-91 scoreline. K is for Kelvin. Which is basically Celsius (or centigrade if you’re old like us) but 273.15 degrees higher. We’d estimate the temperature in the hall today at around 320 degrees Kelvin, ie it’s sweltering. Thank goodness then that the fridge on the bar is keeping the drinks they sell at a temperature roughly akin to swigging directly from a freshly boiled kettle. Gadnammit. L is for Losing at home. Something the Rockers have only ever done once in front of an audience. That was last time out against Middlesbrough’s mighty Milk Rollers. Losing at half time, on the other hand, has become something of a habit recently. We wouldn’t normally be concerned, therefore – they’ve pulled it back from far bigger intermission deficits than this one – but then again, those haven’t been quite the (good natured) ‘grudge’ match that this one is. In summary: Eep! M is for Mistress Von Über Vixen. The veteran (in terms of skating service not age, obv) Rockers star is back from a year’s injury lay-off and is turning out for the All-Stars for the last time today. The milestone of her retirement duly formed the focus of the Brighton team’s skate out, with the whole squad donning cardboard Mistress face masks – apart from Mistress herself, that would be a bit too meta. The players were also announced with their numbers, but her name: “number five, Mistress Von Über Vixen… number six, Mistress Von Über Vixen…” and so forth. Somehow the others managed to keep this whole fiendish plan secret from the legendary lady herself. There may have been some tears. O is for Off we go. Very few points poached in the second period’s opening jams. Sham battling through on the inside line, but Dyduch on her tail. Bash running into a tough Croydon wall. 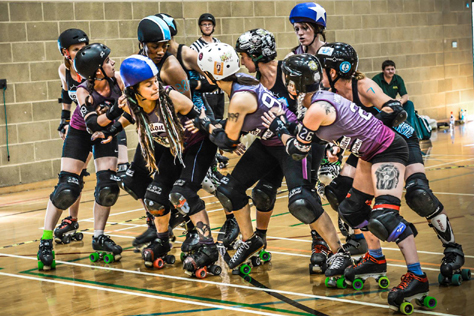 Smashasaurus Bex, Turbo Chick, Inara and Total Bevlam amongst the standouts in the Riot Squad packs, resplendent in CRD’s purple-grey gradient team tops – if there’s a snazzier uniform in UK derby, we’ve yet to see it. Agent Cooper starting to feature in the Croydon star in the second half. Vikispeedia besting Bash now, before being taken out by Sham. Resilient blocking from the likes of Emma The Condemner, Chaka Carnage, Cake Or Death and Anti-Gravetty in the Brighton black, but something needs to change. CRD aren’t letting that differential slip. P is for Pace. As someone mentioned in the interval, Croydon’s starheads seem to have that extra bit of pace to close Brighton’s down. With Cooper added to the rotation, they’re if anything even pacier this period. The Rockers will use Bash more sparingly in the star for the middle portion of this half, with debutant Swann taking over a few of her jamming stints. Bash’s physicality in the pack is a key weapon in slowing the Riot Squad jammers down. Brighton are missing a few jammers here, and pace-wise Kapow! and Chariot Sophia are the most notable absentees. Rose is as sprightly as a sackful of squirrels though, finding inside lines amidst speed skating passes. Starting to feature a lot in the star now. Rose, Whooligan, Rose, Swann, Rose it goes. Battling two-wall of Emma and Bash keeping Cooper pegged back as the rest of the Rockers pack sit it out in penalty box. Sussex side clawing things back, jam by jam. 101-110 now. Touching distance. Croydon, visibly rattled, call a team timeout. Q is for Quarter (final). The game resumes with less than fifteen minutes left on the period timer. Sham holding up Polly, jammer on jammer, lining her up for Hairy Fairy to knock her off. Hairy, Bash, Whooligan and Hyde ‘N’ Shriek forming up as one of the toughest Brighton packs available, playing Polly like a pinball ball, as the Rockers take a 114-110 lead. Swann v Cooper, two penalties in one jam to the former, lead change to the latter. 114-129. Hairy has fouled out on seven penalties. Emma will take her place in the power defence. Enyo Face battling to contain a zippy Viki. Aborted star pass sees the latter making a scoreless pass. 132-140. It’s intense. It’s Bacardi Breezer intense, but the bar bloke is wheeling everything out of the hall to start mixing the punch. R is for Racey. Taking the place of Maude Fondeo as line-up manager alongside regular bench coach Mass Janeycide, the erstwhile Rockers captain’s loud, undisobeyable voice is perhaps a missing piece of the on track jigsaw. An announcement later in the summer confirms a long period off skates for the Aussie whipsmith. Elsewhere, Sophia remains MIA, and rumours emanating from Rockers Towers suggest other big names are preparing to take a step back. There’s some inevitability to this. 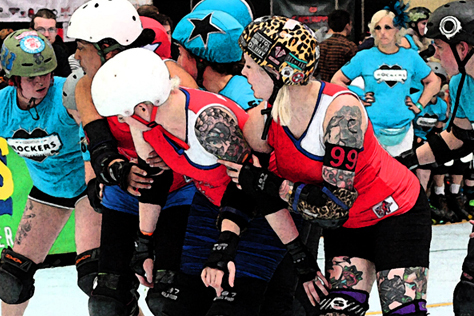 The Rockers, like most competitive UK derby leagues, were formed in 2010. Almost everyone seems to be in a transitional phase four years on, as it seems that’s the limit before a derby team has to regenerate. So where are the replacements coming from to plug those gaps (be they temporary or permanent) in the Brighton roster? The Rockers have almost year-round Fresh Meat programmes these days, from which more gems will surely emerge. What of transfers? That’s something opponents Croydon actively pursue, with players coming in this summer from the likes of Eastbourne, Brighton (non A-team) and elsewhere. The Rockers have but a few. They could do with a few more. This is, after all, the most transient of transient towns. S is for Swann. A case in point. Many other leagues have skaters that travel to training from 50-odd miles away. 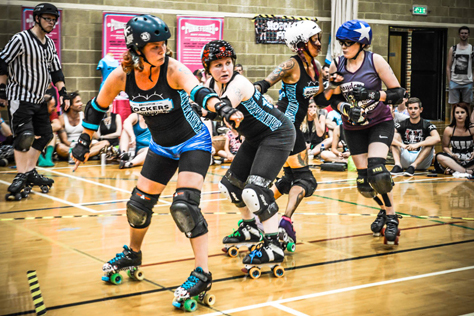 Until the Hastings-based former Bombshell joined the Rockers this summer, Lewes and Worthing were about the furthest afield Brighton had recruited from. Swann – golden of helmet, concrete of shoulders – is supported here by a phalanx of Bombshells, all waving handmade signs saluting her awesomeness. It’s been a mixed game (penalty heavy when jamming) but simply being rostered here, scant weeks after joining the league, is indicative of how important the Rockers believe their new arrival could be over the coming season. T is for Thwack! Bash sends Dyduch flying into a wall at circa 80 miles an hour. Penalty called. Against Dyduch not Bash. “Rule 5.11.137(g) damaging opponent’s venue by being propelled into it is an offence.” Or maybe it was a track cut. U is for Underdogs. Croydon, on paper, at the outset. Brighton, on track, for much of the game. The South Londoners have put up quite a battle. The pace of Viki and Cooper, wiliness of Gin and Dyduch, and ferret-tough battling of Mosquito, Bevlam and others have brought them to the brink of winningness. Are the Rockers prepared to let slip a second home defeat in a row? Sham bags the lead change as Dyduch sits in the sin bin. 142-140. Bash v Gin. Sham tussling one on one with the Croydon jammer, knocking her off, dragging her back. Rose v Dyduch. Sham v Viki. Rose v Dyduch. CRD bench coach Herbielicious calls a team timeout with 27 second left on the clock, forcing one final jam. W is for Winners (of Awards). Total Bevlam picks up CRD’s best blocker award, with best jammer going to Vikispeedia, and Polly Filla bagging MVP. Brighton’s gong winners are Derby McGee (blocker), Rose Bleed (jammer) and Bash as MVP. X is for X-ray. Fortunately the game is injury-free, so none of the players need one. None of the players need a xylophone either. Heck, no-one ever needs a xylophone. Y is for Yagermeister (phonetically, at least). Which is not as chilled as we’d like, here at the after party in the Marwood – we’re used to those machines that spit it out colder than a politician’s smile – but after the Dolphin bar anything without steam coming off it is damn well cold enough. There is party games. There is dancing. There is post mortems of the contest. Mostly, for us at least, there is Jägermeister. Or maybe there isn’t. Maybe they don’t sell it, and we’re just drinking tiny glasses of cough medicine flavoured coffee. By this stage in proceedings we can’t really tell. Z is for Zoom! Another game already! (And not just because we’re so damn late with this report, oh no, not at all.) 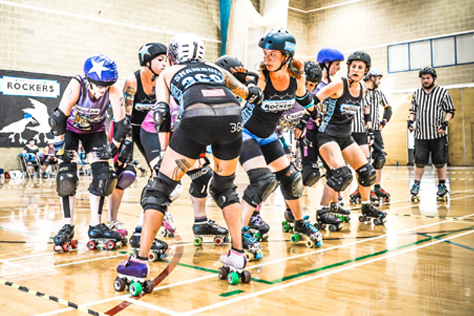 The Rockers are back in action in Haywards Heath this Saturday (20th September) against Bristol’s Harbour Harlots. Whilst the South West side are ranked a fair way below Brighton, they’re actually the only lower ranked team to have ever beaten the Rockers – although Croydon gave it a damn good go. So will Brighton get their revenge? Or will Bristol shock the Rockers once again? A full preview will appear on this site very soon. In the meantime, go get your tickets from the link below.